Among my bundle of books to take to England (which turned out to be woefully inadequate as I’m such a fast reader) I included two recent novels by Newfoundland authors, one of which was Alison Pick’s The Sweet Edge. This is a short and spare novel about a twentysomething couple, Ellen and Adam, whose relationship has gone awry after three years together. They spend the summer apart, Ellen working at a boring job in a city she doesn’t like and Adam taking a long-dreamed-of canoe trip alone into the Canadian North.That summary pretty much tells you what’s annoying about these characters, neither of whom I liked much at the beginning of the novel. Adam is the poster boy for Self-Absorbed Jerks Afraid of Committment, while Ellen is typical of the kind of woman I meet so often in novels and so rarely in real life: passive, indecisive, a bystander in her own life. Things change during the novel, however. Adam’s trip up North is the classic man-against-the-wilderness-finding-yourself journey, but there are twists he hasn’t forseen: the trip forces him to confront his own weakness and his need for other people. Meanwhile, Ellen goes on her own journey of self-discovery without ever leaving Toronto, though she does travel around it quite a bit. Her voyage is made not in solitude but in community; the group of new friends who help Ellen “find herself” are among the most engaging characters in the book. In the end, then, the book accords well with my own recent musings about “finding yourself” on a journey: community is as important as solitude in self-discovery, if not more so.Starting out by disliking the major characters is not usually a good sign for a book but by the end of The Sweet Edge I found myself caring about Ellen and Adam in spite of their flaws. I was interested to see how Pick would end the novel and I wasn’t disappointed (though a bit frustrated by a detail that, in a very postmodern way, is left hanging at the end). The language is one of the delights of The Sweet Edge. I’m not always keen on novels by poets (Pick is best-known as a poet and recent winner of the prestigious CBC literary award for poetry) because too often the language takes centre stage, leaving plot and characters to fend for themselves. Here, however, Pick’s subtly elegant prose is always used in the service of the story, so that you never forget you’re reading a novel — a very well-written novel, but not one that screams, “Look at my prose! How lovely it is!” Rather, we’re drawn to look through the clear window of Pick’s prose into the lives of two people who are flawed and fallible, but who are also able to change. Labyrinth has all the obvious ingredients for a Book Trudy Should Love. It’s an adventure-in-research, with a volunteer on an archeological dig making a discovery that suddenly has a lot of sinister people interested in either recovering, or covering up, a centuries-old secret. Strong female characters — 13th-century Alais and the modern-day Alice who may be her reincarnation — are at the centre of this novel. It also has both history and religion (it focuses on the Albigensian Crusade in southern France), and even labyrinths! What’s not to like? Well, nothing, but sadly there wasn’t much here to really fall in love with either. The story is well-executed and kept me turning the pages, but for some reason I was not drawn in to the novel the way I would like to have been. The main characters never became compelling enough for me — perhaps because there were so many characters that even in 600+ pages I felt there was too much going on to keep track of. Normally I like long books, but I felt that the payoff at the end of this one was not entirely worth it — I expected a labyrinthine complexity of plot but this somehow fell flat. There are plenty of plot threads going on and they do tie together, but the emotional impact that would make it all meaningful seemed (to me) to be lacking. Put it this way: I bought the book to read in England, and it was so bulky it was hard to fit into our luggage. So I decided to leave it in the hotel room, because I knew I probably wouldn’t be rereading it. It’s by no means a bad book, but given the ingredients at hand, it didn’t add up to as much as I’d expected. Like far too many Christians, I would have to confess that my knowledge of Judaism pretty much left off where the Bible ended and picked up with the Holocaust, with no real sense (despite my history degree and broad reading) of what Jews were doing for the 2000 years in between, except wandering around without a homeland and getting persecuted by bad Christians. Until a couple of years ago, I wouldn’t have recognized the name of Rashi, the most famous medieval commentator on the Talmud (or even have been able to explain exactly what the Talmud was). I still wouldn’t say I know a lot about, say, medieval European Judaism, but I’ve become much more curious and interested in filling in this gap in my historical knowledge, which is why I eagerly picked up Maggie Anton’s first volume in her series Rashi’s Daughters: Joheved. The series does what it says on the tin: it brings to life the family of Rashi (Salomon Ben Isaac, as he was known in his lifetime), devout Jews living in France in the eleventh century, through the characters of the women in the family. The oldest daughter is studious Joheved, who wants to study Talmud like a boy. Anton has done a wonderful job of recreating the time and place of the story, drawing us into a world that most readers, like me, probably know little about. I do have quibbles with the book: Anton’s knowledge of the period is so thorough and detailed that her research often jumps front and centre, drawing attention away from the characters and plot. The dialogue is often forced to carry the weight of heavy-handed exposition, which keeps the reader at arm’s length. But despite these flaws, the first volume of Rashi’s Daughters is well worth reading for its glimpses into women’s lives in eleventh-century France, Jewish life at the period, and the role that Talmud study played in that life. I will be looking out for the next novel in this series. My husband’s thumbs-up on this book (which he gives with great enthusiasm) is probably more significant than mine, since Jason is the Sherlock Holmes fan in the family. The Beekeeper’s Apprentice is the first in King’s series of novels re-imagining the famous detective in retirement with an unlikely apprentice: an exceptionally brilliant young woman named Mary Russell with a mind as keen and analytical as Holmes’ own. I am not a huge mystery fan, though I do enjoy some of the classics. I have read all the original Sherlock Holmes stories, and I am a huge fan of the Lord Peter Wimsey mysteries by Dorothy Sayers. In some ways what Laurie King has done here is similar to what Jill Paton Walsh did in taking over the Lord Peter Wimsey series and writing new adventures for the great detective, but I think King’s attempt is more successful, and I’ll try to explain why. First, there’s the obvious fact that I’m a less stringent critic in this case than I was with the Wimsey novels: I am so intimate with Lord Peter (don’t I wish!) that every nuance and tone is familiar to me, and rings false if it’s “off” (which I frequently find it is in Jill Paton Walsh’s version). Not being a rabid Sherlock Holmes fan, I’m less likely to be bothered by discrepancies between King’s new version and the original Arthur Conan Doyle product. But King has also handled the issue of the narrator in a way that allows her to account for discrepancies: while the original Holmes stories were told from the point of view of Holmes’ loyal sidekick, Dr. Watson, The Beekeeper’s Apprentice uses Mary Russell as first-person narrator, and she tells the reader up front that she knew a different side of Holmes than Watson did, and so the way in which she depicts the great man is bound to differ somewhat. The most appealing thing, to me, about The Beekeeper’s Apprentice, is that both Sherlock Holmes and Mary Russell are complete, well-rounded and fascinating characters who keep me completely engaged in the story. I’m much more of a character-driven than a plot-driven reader, which is why most mysteries don’t appeal to me. Both Jason, who is more of a typical mystery reader, and I wanted to read more of these novels, and the next two in the series (A Monstrous Regiment of Women and A Letter of Mary) are packed in our bags waiting for our trip to England! 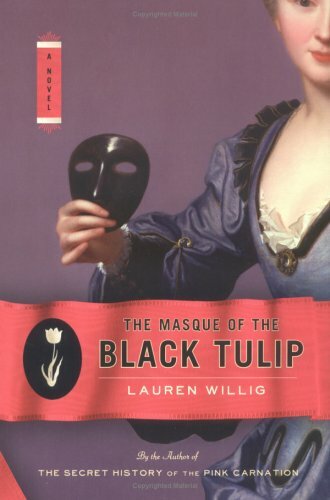 Having just talked about how much I like those “Adventures in Research” novels (below) I figured I’d definitely like Lauren Willig’s novel about a history grad student chasing down information about French and English spies in the era of the Napoleonic Wars. The story alternates between the grad student and the historical characters she’s researching. I didn’t realize till after I had this home that it’s a sequel to Willig’s earlier novel, The Secret History of the Pink Carnation, but I didn’t find it hard to pick up the threads. It’s a light, easy read, kind of Adventures-in-Research-meets-chicklit. I was 3/4 of the way through before I realized that the sticker on the spine of the book said “Romance.” I hadn’t realized this was marketed as a romance novel; the fact that it was, means that I had taken Brenda Coulter’s read-a-romance-novel challenge without knowing I was doing it! Actually, once I knew it was a romance novel (and a much smarter novel than I usually think of romances as being) some of the things that had bothered me about the novel began to bother me less. There’s a definite fluffiness to Willig’s tone and a lack of depth to the characterization which makes more sense in genre fiction than in something intended for the so-called literary end of the bookstore. (Why this should be so is, of course, a whole other topic). The fluffiness bothered me more in the historical sections of the story (which take up the bulk of pages in this novel). While the details of the Regency setting were all there, something about the characters’ tone and attitude seemed oddly modern — like 20th-century chicklit transported to a Regency English drawing room. I’m not saying that if you write about that era you have to imitate the style of Jane Austen, but the reader should believe that your characters are actually living in that era and thinking as people of that era do, and I wasn’t convinced of that with Willig’s historical characters. That being said, while some of the unintentional anachronisms are annoying, there are also a few obviously intentional anachronisms which I found hilarious. Anyway, it appears I’m willing to cut a book much more slack after I see a few hearts on the spine sticker, because once I started thinking of it as a smart historical romance novel, I was able to stop criticizing and enjoy The Masque of the Black Tulip for the light, amusing romp it is. I would definitely read both the book that came before and the planned next book in the series — The Deception of the Emerald Ring — even if it means being seen in the romance section of the library! There’s a subgenre of fiction that could best be described as “adventures in research,” which almost always hooks me at first glance. Basic plot of an Adventure in Research — a scholar, or a pair or small group of scholars, discovers an ancient and forgotten manuscript, or clues that point to the possibility of an ancient and forgotten manuscript, or a historical mystery somehow linked to an ancient manuscript. They then drop everything and run around the world searching for it, piecing together the clues to a discovery that will revolutionize literature, or theology, or history itself. Along the way the scholars usually have to work out their own relationship and/or resolve some personal issues.Adventures in Research novels range from the wildly successful and critically acclaimed Possession by A.S. Byatt (one of my personal favourites) to the wildly successful and critically derided Da Vinci Code by Dan Brown (not one of my personal favourites) and also include such gems as the vastly under-appreciated Gospel by Wilton Barnhardt (probably in my all-time Top Ten favourite books). The genre often pleases me with books that are relatively good though not great (Chasing Shakespeares, by Sarah Smith, or Ex Libris by Ross King) and sometimes disappoints me with books that simply don’t deliver (Elizabeth Kostova’s The Historian was one such for me). With all this in mind (and despite my ingrained prejudice against male authors), Lord Byron’s Novel was an easy sell for me when I picked it up in the library the other day. I had heard nothing about the book nor read anything else by John Crowley, but I was immediately hooked by the premise: notes to a previously unknown Byron novel, annotated by his estranged daughter, are discovered — but where is the novel itself? This was definitely one of the most successful Adventures in Research I have read in a long time, even though there was much less chasing-the-manuscript-across-the-capitals-of-Europe than one generally expects in such a novel. There are really three stories here: Byron’s actual “lost novel” takes up most of the pages, and Crowley has done a wonderful job of creating the sort of gothic novel Lord Byron might actually have written, gloriously overwritten and full of Romantic punctuation and italics. The chapter notes give us a glimpse into the life and mind of his daughter Ada, who writes her commentary on the novel while dying of cancer and uses the experience to work through her complex feelings about her famous father. Finally, the researcher on the case explores not just the quest for Lord Byron’s novel but also her own relationship with an estranged father through a series of emails to her father and her partner. All three stories are vivid and compelling and kept me not just turning pages but also thinking. Crowley is brilliant with language, too — from his ability to capture a Byronic narrative voice, to his nuanced appreciation for the different voices people use in email communication.